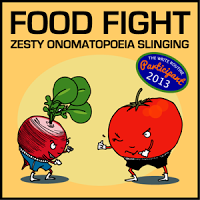 Marcie Colleen is hosting a Food Fight at the Write Routine in celebration of World Read Aloud Day on March 6th. I started a story below which stops where a food fight is breaking out. But I need your help. Please read the story and any comments to date, then add a comment which grows the story, includes one thrown item of food, and one word of onomatopoeia (which has not yet been used!) Then over the weekend, I have to wrap up the story with one last comment. Together we will write a story! You can comment more than once on a story, however, you cannot follow one of your own comments...someone else needs to comment before you can comment again. Have fun! "Eek!" Timmy squealed as he entered the swanky restaurant. Daddy froze like the plaster statue standing in the waiting area. Mama's bulging eyes reflected the white tablecloths at Chez Italiano. She grabbed Timmy's hand and started backing out the door. "Don't be silly," Grandma said. "A lady only turns 95 once, and I simply must have my handsome grandson here with me to celebrate." "Timmy's not a neat eater," Mama said. His spoon tended to catapult peas, and his bowl was more like a watering can. If he had three mouths, he would probably still miss one. Mama always put four shirts on him at dinner, so she could peel one off when it became messy. Still, Timmy was always excused from the table naked. Grandma put a white cloth napkin on Timmy's lap and pinched his cheeks. Timmy loved his Grandma. She smelled of pancake syrup, and her hugs were like lying in a warm mud puddle (something he enjoyed very much.) He would try his best to make Grandma's special dinner nice. Timmy nibbled tiny bites of his garlic bread like a bunny. He peeked at his napkin - clean! He slowly slurped small spoonfuls of Italian wedding soup. He looked down at his four shirt - dry! He gave a quick fist pump of pride, but his elbow came down on the end of the spoon and catapulted a mini meatball through the air. The meatball smacked into the cheek of the baker, Mr. Frederickson, causing him to choke briefly on his garlic bread. Surprised by the insult the baker looked at the butcher, Mr. Jones, who had soup on his spoon. Mr. Jones nodded politely at Mr. Frederickson. Timmy wiped his sweaty palms off on his napkin and reached for the safety of garlic bread. The slice required a tug, but he lost his grip. The loaf landed right on Mr. Jones head, raining crumbs in his hair. Mr. Jones looked at Mr. Frederickson who made a face just a little too snotty to be innocent. Mr. Jones grabbed a two foot French bread and threw it like a javelin at Mr. Frederickson. The baker, who was obviously trained in avoiding oncoming bread, ducked just in time. The spear careened over his head and into the chest of Ms. Adams, who was leaving with a takeout order. Ms. Adams, not one to allow bread down her shirt, carefully removed the lids from her order and threw one each at the baker and the butcher. When you are done here, stop over to the Write Routine to play in more food fights! Ha! This is too cute Lauri! The lids clunked into the baker and butcher's backs leaving red sauce stains that looked a lot like targets. The butcher and baker leaped to their feet with such energy, that the butcher's wife received a goodly SPLOOSH of red wine over her anniversary dress, while the baker's boyfriend sported a spaghetti tie! Timmy giggled. His parents were mortified. Grandma was delighted. "I never pass up a good food fight," she announced. She stood up, grabbed a handful of tomato and mozzarella salad, dripping with olive oil and balsamic vinegar, and flung it to the baker. SPLAT! The mess landed on a woman the next table over, on her perfectly coifed hair. Timmy laughed out loud. He picked up his soup and poured it over his dad's head. His dad took a T-bone steak and threw it at Grandma, who was running around pouring people's soup on their heads. He missed, hitting the manager instead. The manager picked up somebody's salmon (it might have been Miss Kay, the preschool teacher, but Timmy couldn't tell because of all the food on her) and threw it at Mom. It was total chaos! But it didn't end there! The woman with the mozzarella in her hair grabbed the cannelloni from her plate and squeezed the insides straight into the waiter's collar -SQUWOOSH! It slid, like a ring round the collar, as the Waiter stared round the room, waiting for the perfect moment to fling with a Zing a great oozing mound of tiramisu, that landed all over, you know who! Grandma, wearing tiramisu from her ears to her shoulders shouted to the crowd, "Happy Birthday to Me" and raised her glass. I love a good food fight and expect to live to be one hundred so open wide, because here comes the champagne! The champagne cork whizzed around the room and finally landed in a diner's lap. She was so startled that she flung the cannoli she was eating across the table WHAP, cream, crumbs and chocolate chips now decorated her hubby's cashmere sweater. He stood up stunned and bumped the waitress with a tray full of sodas that emptied in a SHWOSH all over Timmy and his parents. "What is going on here?" someone bellowed. It was Sam Bristle the police Sergeant, stopping by for a bite to eat. He got much more than a bite, though. BUNK, SlATTER, WOOSH a gob of mashed potatoes, a slice of blueberry pie, and a clump of fettuccine with Alfredo sauce found their way to the Sergeant's head and shoulders. "All I wanted was a Calzone to go," he said. SPLOP-"Here's your calzone Sam," said the butcher, as he squirted its filling on top of the ala carte dinner the sergeant was already wearing. "That's for the speeding ticket you gave me last week; it's on the house!" Timmy stripped off his top two shirts and found a clean layer. He climbed up on top of the no-longer-white tablecloth and yelled, "Stop!" Everyone froze holding food in the air ready to throw. "This was my Grandma's 95th birthday dinner, and even though I'm messy, I just wanted it to be nice. Now, I've ruined everything. I'm sorry Grandma!" "No, Timmy, you didn't ruin it," Grandma said. "In fact this was the best birthday I've ever had!" Grandma hugged Timmy so hard tiramisu squished all the way through his last two shirts. But that's okay, because it just wasn’t dinner with Timmy unless he was excused from the table naked.